For Bijili Suraneni and Tanuja Kamadana, a four-bedroom apartment in Kokapet provides the perfect location for creative living and unconventional style. 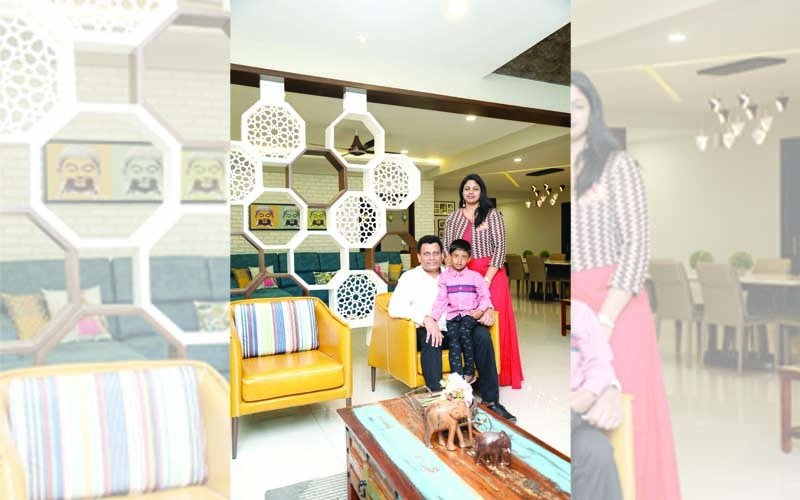 It wouldn’t have been possible without their interior designer, Padma Somireddy of Divine Designs, who transformed the apartment into a spacious retreat. This week, we have a look around this living space that sparkles with elegant interiors. While grey and white remain a consummate classic for both colour lovers and neutralists alike, interior decorators have lately been particularly keen on minimal shades. Take Padma Somireddy of Divine Designs, for instance. Reflecting her urbane sensibility, while allowing for a bit of airing out, Bijili Suraneni and Tanuja Kamadana’s four-bedroom apartment in Kokapet proves why classic colours never goes out of style. Most of the rooms positively brim with a cohesive neutral palette, with occasional pastel accents. 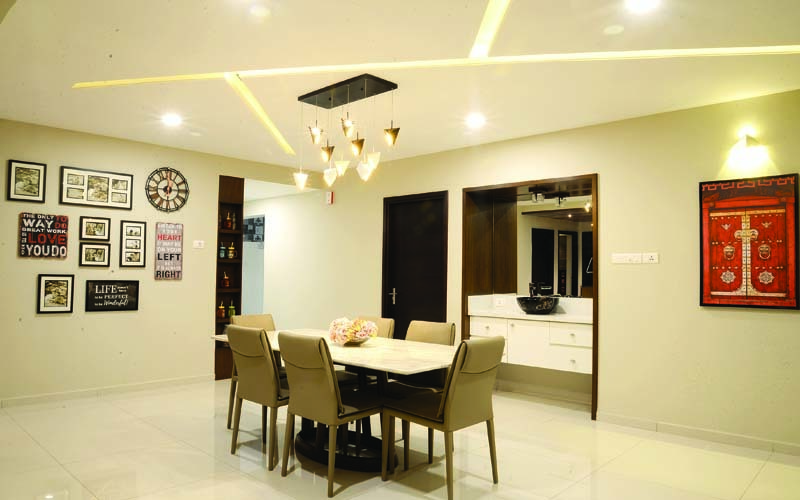 “Our aim was to transform our house into different segments, which adds an interesting flow to the space. Most walls are done in white and grey, while some are done in pastel to keep the house vibrant. To accentuate all the walls, decor ranging from funky mirrors to quirky wall hangings and beautiful paintings have also been used,” Bijili states. Padma punched up the sophisticated atmosphere with eye-catching light fixtures that include ceiling-mounted lights in the living room, a confection of LED lights in the bedrooms, and an industrial chandelier in the dining area. As for the furniture, Padma anchors the apartment with vibrant pieces that have been expressly acquired. In the drawing room, there are two couches – a grey sectional and a vibrant shade of yellow chairs, with complementing multi-coloured pillows. Across the room, what appears to be a teal couch contributes to the sense of spaciousness. Full, green foliage and an eclectic wall are excellent companions to the couple’s colourful furniture, and an octagonal-design wooden partition helps the pieces pop.” Our furniture is mainly from stores in the city. Since the theme was modern, we didn’t buy any antiques. 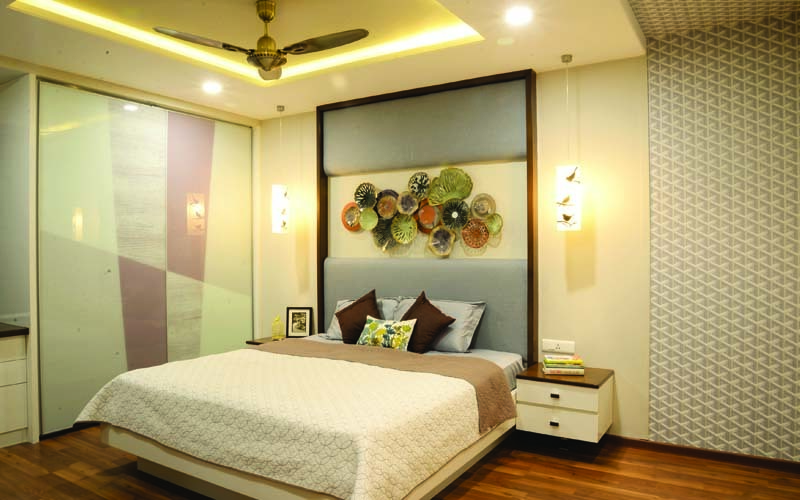 We opted for vibrant and contemporary,” Bijili adds. Opposite is the dining room, where an elegant dining table –always decorated with scented flowers – is paired with a set of chairs ideal for the narrow space. “We wanted plenty of free space, so we haven’t accumulated too many artefacts or paintings in this area. 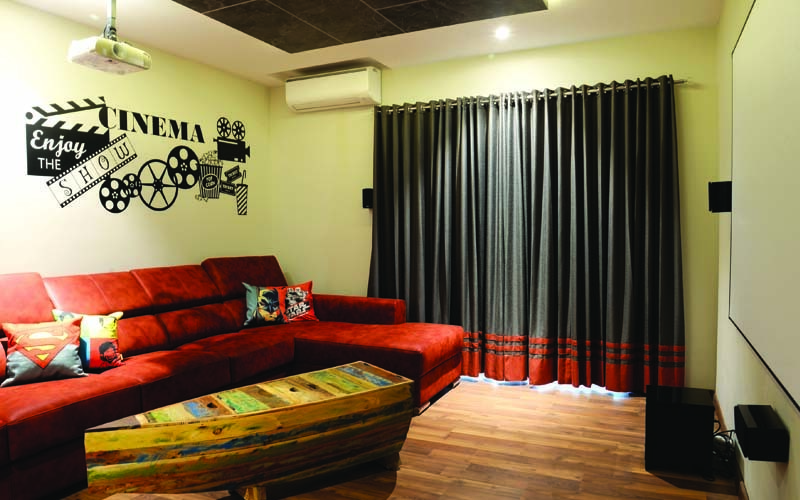 Padma understood our requirements very well and gave us a clean space that’s perfect for our growing family and is equally stylish,” Tanuja explains. This is followed by the puja room, which is accessible from the dining space. For gastronomic purposes, the couple opted for the ultimate kitchen that could put chefs to shame. For casual dining, cooking prep, and storage, the kitchen is centred by a monumental but practical island that is the ultimate example of bespoke cookery. 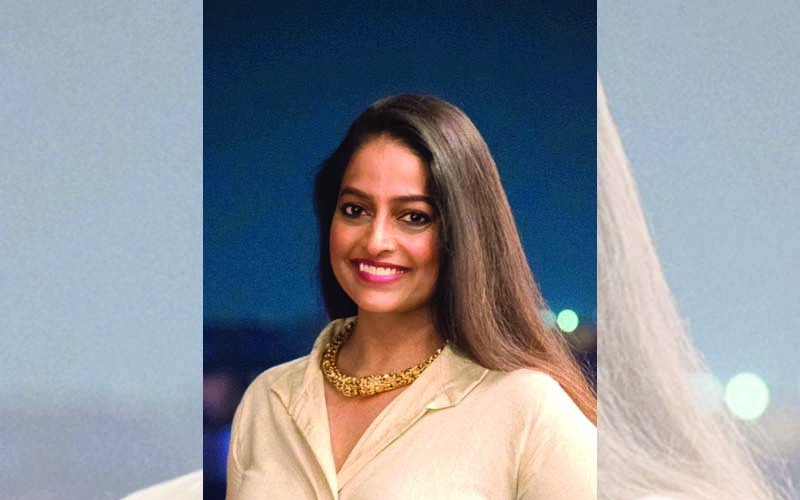 When the Suranenis were puzzling over how to make the kitchen look different yet feel like the rest of the house, Padma opted for the combination of teal and white. To keep storage similarly unobtrusive, Padma furnished the contemporary eating space with clean-lined and modern pieces. Adjacent, surrounded by the drawing room, is a home theatre, where the family often comes together to unwind. Past this area is a narrow walkway that leads to the master bedroom. Here the couple played it safe by opting for white walls with grey accents. They chose a classic yet comfortable king-sized bed, a side table, and stylish cupboards. They then added jewel-like pops of colour, using a designer headboard and cushions. 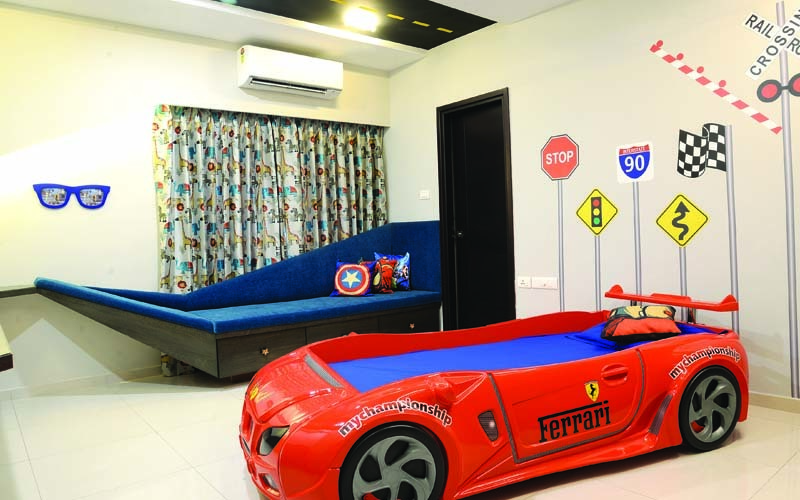 Then there are two other rooms that serve as a guest room and bedroom to their five-year-old boy, Tanav Suraneni. Here Padma added plenty of colours, a car bed that gives focus to the space, and a quirky couch near the window that shows playful design at its best. In the end, the Suraneni’s home is a fine balance of feminine and masculine, texture and pattern, and just the right amount of colour. The result is a space that’s fresh and elegant.